Would we donate more if we felt like we'd really been there? 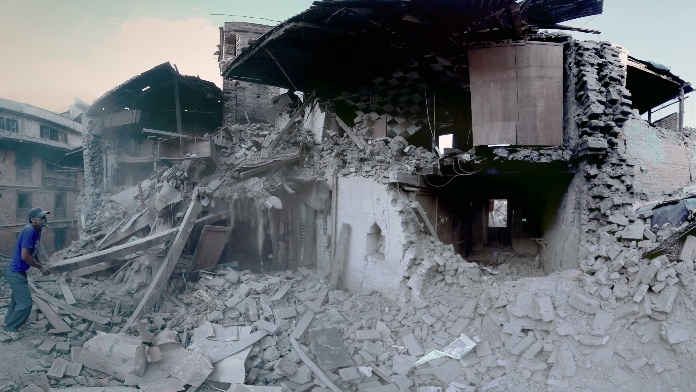 A new film made for VR lets us experience what it is like to live in the aftermath of the Nepal earthquake on 25 April. The four minute film, narrated by Susan Sarandon, can be viewed here both in your browser or using a VR headset. It has been produced by RYOT News, a website aimed at young people in which 'every story lets you take action'. RYOT encourages financial/volunteering/activist contributions in viral posts and helps charities and non-profits reach audiences. RYOT's own Hayley Pappas wrote this about the film which shows emergency workers, families waiting in line for aid and destroyed monuments: "In some tiny, fragmented sliver of a way, I think virtual reality may afford us that propensity to love and to know the world from the inside. "Throughout the duration of a virtual reality experience, the virtual reality controls your attention. You can't check your phone, look at your Instagram, or write an email. For that moment in time, you're present." When you view the short film, it's immediately apparent - even just in the browser - that as a tool for social justice journalism, VR has the potential to be much more powerful than arm's length still photography and rolling TV news. The element of interaction - turning your head - means you are choosing to view people struggling to save lives or keep surviving, not choosing to look away. It's not just a few children clutching belongings in front of you, they're behind you too. As Westerners wander through the ruins of temples, you feel like you're there, wandering amongst the destruction with them. We can't think of anything - stats, photos, appeals - that have made us want to offer help more than this. We've seen some interesting early attempts to maximise VR's potential as an "empathy machine." Vice News, Chris Milk and director Spike Jonze collaborated on one of the first ever VR broadcasts - of anti-police brutality protests in New York - which you can watch now on Google Cardboard and Samsung Gear VR. VR news app Immersiv.ly's Edward Miller shot a similarly immersive seven minute 360 degree video on the 2014 Hong Kong protests. As part of the Sundance Film Festival's New Frontiers selection of VR films and experiences, journalist Nonny de la Peña took cinephile visitors to a CG Syrian refugee camp and Rose Troche presented a two part film from both a male partygoer and a heavily intoxicated female partygoer's perspectives, in which the woman is raped by the man. "Though the fidelity of the hardware has a long way to go, the empathetic power of the format is almost overwhelming," said director Ben Aston who reported on the VR storytelling at Sundance for Wareable, "There are points where I want to reach out and stop what is happening, but I can't see my hands, I'm a ghost in the machine forced to sit back and watch what is a reality to far too many people."